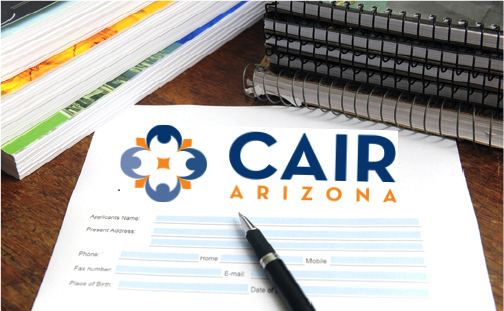 The Council on American-Islamic Relations Arizona Chapter (CAIR-AZ) is proud to announce the launch of its new scholarship program. This year, we will award two (2) winners of the $500 CAIR-AZ Scholarship will be announced in August. Additionally, the recipients will be recognized at the CAIR-AZ Annual Banquet on November 9th in Mesa, Arizona. The application deadline for the scholarship is July 15th, 2013. How do you plan on making an impact on the civil rights landscape in America today? • Be enrolled in or accepted to a full-time undergraduate, graduate or professional program of an accredited college or university in the United States for the fall 2013 semester. • Resume demonstrating a commitment to civil liberties issues and/or community service in employment or volunteer experiences. • Bio statement (150 words max). How long and in what capacity they have known the applicant. Reasons for recommending the applicant for this particular scholarship. Other comments relating to the applicant’s participation in or knowledge of civil rights, social justice and/or peaceful conflict resolution issues. • Sign the attestation and application signature portion of the application. • Submit a complete application by 5 p.m. on July 15th, 2013.